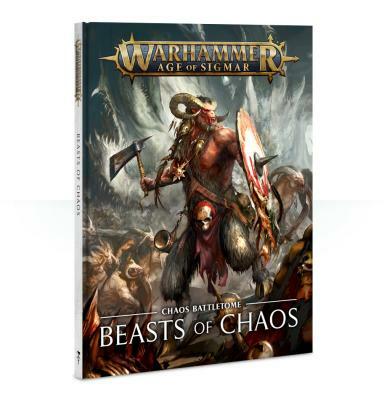 In the 104-page hardback Battletome: Beasts of Chaos, you’ll find: - From the Wilderness They Come: an introduction to the Beasts of Chaos, savage and twisted creatures that spread anarchy throughout the Mortal Realms; - Primaeval Origins: the Beasts of Chaos pre-date even the earliest records by any scribe, and the oral traditions describing them have long faded into memory – but legends persist, and are presented here; - The True Children of Chaos: Beasts of Chaos’ inherent ferocity is not a gift bestowed by the Dark Gods, and nor is it due to enslavement – they embody Chaos in its purest and most anarchic form; - The Way of the Beast: while the Beasts of Chaos are as varied as the wildlands in which they gather, certain traits – violence, mercilessness and predation – are common to all; - Detailed explanations of the Greatfrays and beastherds of this faction, their motivations and (known) histories; - Annals of Entropy: a chronicle of the recorded events in which the full savagery and fury of the Beasts of Chaos was unleashed; - Gathering of the Greatfrays: explanation of the organisation of the Beasts of Chaos armies, including an example of how a particular beastherd is organised, along with descriptions of 7 legendary Greatfrays (Allherd, Darkwalkers, Gavespawn, Skullfrays, Twistfrays, Rotfrays and Slakefrays), including their heraldry and colour schemes - Explanation and background of each character and unit available to a Beasts of Chaos army; - A showcase of beautifully-painted Citadel miniatures, with an example army and comprehensive painting advice from the experts. This advice covers a huge variety of examples and techniques, showing you how to achieve effects like glowing runes, mutated flesh, horn striation, scales and liver spots, and add icons and beast markings to your miniatures. On top of this, there are step-by-step guides to the colour schemes of the following Greatfrays: Allherd, Gavespawn and Darkwalkers, as well as specific effects for each Chaos God. Rules All the rules you need in order to get your Beasts of Chaos army ready for the gaming table are here: - 25 Warscrolls, covering every miniature available to the Beasts of Chaos faction and including 3 Endless Spell warscrolls – Doomblast Dirgehorn, Ravening Direflock and Wildfire Taurus – for use with Malign Sorcery; - Allegiance Abilities representing the Beasts of Chaos’ methods of war – including Command Traits, Battle Traits and 3 separate types of Artefacts of power; - Lore of the Twisted Wilds, a spell list available to Brayherd wizards; and Lore of the Dark Storms, a spell list available to Thunderscorn wizards; - Specific Abilities, Command Traits and Artefacts of Power for the following Greatfrays: Allherd, Gavespawn and Darkwalkers; - A Battleplan, including objectives for both sides, deployment map, special rules and victory conditions; - Rules for creating a Beasts of Chaos warband to use in a Path to Glory campaign, including a Followers Rewards Table and Champion Rewards Table; - 8 Warscroll Battalions conferring advantages for fielding certain combinations of models; - Pitched Battle Profiles for all units featured in this Battletome, including unit sizes, points values and battlefield roles.